ホーム » 寒地河川NEWS » ニュース » 平成23年台風12号13号に伴う北海道の降雨分布（9/7　0時現在の6日雨量）/Accumulated rainfall during the passage of Typhoon Talas over Hokkaido in 2011. 平成23年台風12号13号に伴う北海道の降雨分布（9/7　0時現在の6日雨量）/Accumulated rainfall during the passage of Typhoon Talas over Hokkaido in 2011. 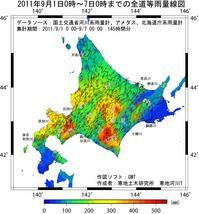 Accumulated rainfall distribution during the passage of Typhoon Talas over Hokkaido, September 1-7(145hour), 2011. 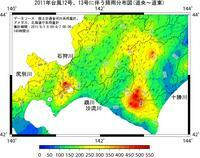 (Rainfall data obtained from Ministry of Land, Infrastructure, Transport and Tourism and Hokkaido local government). All maps are created by Generic Mapping Tools and edited by Adobe Illustrator.